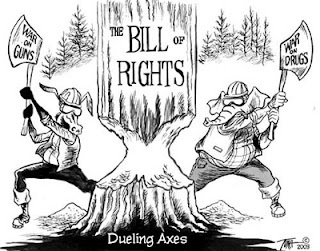 Bill of Rights? What Bill of Rights? One of the biggest problem with these infringements (and outright abnegations) of our liberty is that the politicos change their definitions to mean whatever suits them at the time, and they claim to do it in the name of our own good. Thus, even someone like Indiana Senator Evan Bayh, who proposed a 200% ammo tax and has voted for upwards of 90% of all gun-control legislation calls himself a "staunch supporter of the 2nd Amendment." In the same way, a family of five can be construed as a "gang" if one of the parents uses a handgun to protect their family from thugs, and members of the NRA, GOA, and JPFO can be considered "domestic terrorists" under the auspices of the unPatriotic Act. When asset forfeiture was first conceived; when it was first planned out, I have to imagine that someone of the decision-makers stopped - at least for a moment - to consider that asset forfeiture might be misused by LEO's just out of sheer greed or caprice. I also believe that the notion of corruption entering the system was merely ignored, since we, the subjects are a lower class of citizen, and our Rights exist only at their present whim. Communism is seducing the people with a false sense of security. So basically what is happening is they are exercising there right as part owner. It's a little more complicated by that's the jest of it. Communism here began long before the 1970s. Actually abnegation of property rights began long before that. Ask an Indian. All taxation is the forcible theft of private property at the point of a gun. Justifying it as the 'common good' doesn't make it any less of a theft. If you have to pay property taxes then you don't own your own land. When people consented to property taxes they gave up any pretense of real property rights. Asset forfeiture is just the logical extension of this principle of armed state theft of private property, and it is completely arbitrary. Confusion reigns supreme in people's minds about this constitutional republic. Their views on taxes are likewise confused. It's not a good sign when folk view ALL taxes as evil. Painting with broad brush strokes is tempting (especially with such things as taxes), but must be avoided if at all possible, unless the act in question is indeed an absolute right or wrong, less they skew and deflate the potency of their arguments. The problem is not "taxes" in the abstract, or even high or low taxes for that matter, because as the Buskevik administration has obviously demonstrated, even "low" or "moderate" taxes these days don't guarantee a smaller government when you're determined to operate on nothing but debt and IOUs, as the Bushevik regime is doing. That's why the folk arguing against ANY taxation, or ALL taxation is evil, etc., is a waste of time, not to mention a wrong-headed view. ALL taxes are NOT evil. Excise taxes (duties) and tariffs, for example, are constitutional. And, as for states, they can levy their own taxes and so on. The only taxes that are questionable are the income tax, payroll tax, property tax, and other direct taxes. In any event, it wouldn't change a thing, at least at the federal level. Most (all?) state governments, at least, are bound by their own constitutions and/or legislatures to have balanced budgets (although they rarely achieve a positive balance, as opposed to negative balance or debt). No, the core problem is the commoners' erroneous collective view of what they think government should be responsible for and what they themselves should be responsible for in daily life. If the commoners at large had the correct view of THEIR OWN responsibilities and were not interested in sloughing it off to another party or entity (government), it would short-circuit the tax arguments and get right to the meat of the matter. Taxes at ALL levels would be at an absolute minimum for constitutionally-restrained operation by default since folk would not take a handout for something that THEY KNOW THEY ARE RESPONSIBLE for providing or taking care of. On a side-note, as I've said many times already Will, get ready for the Lizard Queen's coronation in Jan. 2009! "All hail Amerika's FIRST Queen!" (Shub is a coming!) Nothing earth shatterin' as of yet has changed my mind in that regard. I say "pessimism" because I'm not really pessimistic in the grand scheme of things, only in politics in general and in a political solution, in particular, somehow being the remedy for all our ills as some seem to think. But, that's an entirely different argument for another time. Do you have a Ron Paul sticker on your car. If so could you post a picture? Great post, Will. Keep up the fine work. dixiedog: sounds like you're the one confused about the nature of taxes. Not ALL taxes are evil? Are you suggesting that some forms of theft are legitimate? The state that seizes your property without your consent is committing an act of aggression. It's institutionalized theft. So what if this is "legal" or "constitutional"? It's still immoral, and as Jefferson noted, the law often is little more than the tyrant's rule. They can give it a euphemism like "taxation" but it doesn't change the aggressive nature of the act. * All taxes are evil. * Excise taxes are constitutional. Just because something is allowed by the U.S. Constitution does not make it right. I realize that like most folks with a brain you don't watch any or very little T.V. However there is a show that you simply must see. 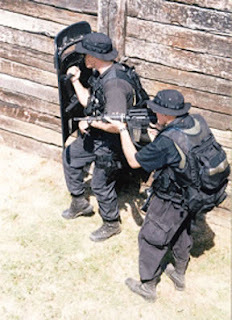 It's called Dallas or Detroit SWAT. It comes on A&E on thursdays. I can hardly stand to watch it. It is a nightmare to behold, if you haven't seen it please go to a friend with cable and check it out. 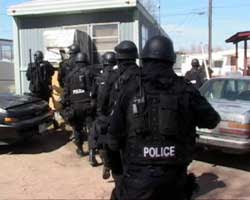 It follows the SWAT Nazis of these departments as the terrorize the local population, then brag about how cool they are. Please check it out, I would love to see your thoughts on this program. Communism has been here a lot longer than that. Since every action of government is presumed to be for the benefit of the community, then all government is inherently communist - a good reason for it to be so limited. If you want evidence of this theory, consider some of the terminology. Pennsylvania is a Commonwealth, a term which itself describes communism. Many of our towns are municipalities, a term which translates directly to commune in many languages. There have also been communist settlements on American soil since before our constitution was written. Indeed, a fertile environment affords many opportunities for exploration of different local political systems. Even families work on a fairly communist ethic. Where communism has always proven much less successful is in larger communities, where it is far too slow to adapt to real world needs and demands of its member citizens. to their needs. This does NOT work on a large scale. Imagine having 100 million kids. How could you even begin to provide for all their needs? Therein lies the flaw inherent in a communist state. Who said theft was legitimate? If you read what I said and come to that conclusion, then your reading comprehension is lacking. I said direct taxes are questionable. Since, of course, not paying a direct tax for an extended period, e.g. property tax, will indeed eventually result in government-sanctioned theft, and it will likely be by another citizen snooping the local assessor records looking for easy pickin's. Remember, government itself cannot normally operate without funds and taxes provide a major chunk of those funds. Now, in regards to which taxes are legitimate or not is a valid question. As for me, I think all direct taxes are, in essence, theft since they are unavoidable legally, but excise taxes, tariffs, and the like are not since you can easily avoid those if you so choose. I realize that, anon. However, as I made clear, I'm not one who thinks ALL taxes are evil, wrong, illegitimate, whatever you want to call it. Ergo, when it comes to excise taxes, I don't think the Constitution is wrong. I agree with the premise that just because some act is "constitutional" doesn't make it auto-righteous. But most, if not all, of the acts enumerated for government in the Constitution can be abused. Our entire governmental construct in America is critically dependent on the people's virtue and diligence. If the aggregate people lose their virtue, this governmental construct by this Constitution of ours is unworkable and collapses. Now, if you and your fellow comrades dream of a society with NO government, then I guess I can understand your thinking that all taxes are evil or illegitimate. But you're deluded if you think this society would function with NO government at all. It's lost its ability to adequately self-govern, which would be über-critical (much more so than is required in a free republic) in a state of anarchy. For those who think that they actually own or their homes, try not paying your property taxes and find who the real owners are. Those making mortgage payments can, of course, use their residences as a major tax write-off and also benefit from any appreciation in value (more difficult to due recently) when it's sold but local governments can seize and even condemn property when it serves their purposes. As far as Dallas Swat goes, according to Radley Balko who covers a lot of consensual crime news from a libertarian perspective, the lead cop on the program (and I'm not kidding now) was fired after being caught with a prostitute in a motel room. That's unfortunate for the producers of the program who must have spent a small fortune on the now outdated dramatic photo of the squad which depicts all the key members clad in body armor and clenching automatic weapons, military sniper rifles, and serious looking shotguns apparently needed in the heroic war against dangerous sinners like pot smokers and poker players. They know that Due Process is an elusive concept to the masses, so to take something they don't understand is quite easy, and I'm actually even surprised it hasn't happened sooner in our nation's history. "Drugs, bad. Police stopping drugs with any means necessary, good." All of the "reality" shows where cops are busting peoples heads and the like only make me sick to the stomach. There was a time I would watch them but it finally hit me that I was playing along with their sick voyeuristic "entertainment". Better to live life rather than be a couch potato and watch life pass you by. This IS the path to communism. Read this and your view of "the Evening News" will be forever tainted. A true wake up call for all Americans who believe they are "free"
Sounds more like a Fascist police state, since free enterprise and corporate power are still respected. You say that direct taxes are theft because they cannot be avoided but indirect taxes are not because they can somehow be avoided, is this correct? By this logic, a highway robber is evil and he commits theft when he deprives me of my property because he seeks me out and I cannot reasonably avoid him. On the other hand, the troll under the bridge that deprives me of property when I cross the river is not evil and does not commit theft because I could have avoided the bridge and the troll by simply staying on my side of the river. The only type of taxation that would not be theft would be a tax that was 100% voluntary. Involuntary taxation, regardless of how indirect, is still theft. History has shown that society can function just fine without government. One example of a thriving government-free society is the Viking settlement in Iceland that existed about 1000 years ago. Look it up. The actual effect of government is to decivilize a society. Government is not necessary for lawfulness, peaceful economic cooperation, or the division of labor. Look at the US now and in the past for a great example of this. Government has grown to unprecedented levels in the modern era. Is our society more civilized because of it? Please do not confuse anarchy with chaos. Anarchy is a lack of rulers or government. Chaos is a state of confusion and disorder. The words should not be used as synonyms. Societies existed in colonial America that were anarchic but not at all chaotic. Iraq has been in a state of bloody chaos since the US occupation of that country and you can hardly call Iraq anarchic. On the other hand, the troll under the bridge that deprives me of property when I cross the river is not evil and does not commit theft because I could have avoided the bridge and the troll by simply staying on my side of the river. A bridge toll is not an excise tax, although it could still certainly be viewed as an "indirect tax," which as I said usually can LEGALLY be avoided with some effort, of course. Don't use the damn bridge. Swim across. Take a ferry if possible. Take the long way around. The point being, it can be avoided. Excise taxes are, for example, what's applied to alcohol and cigarettes. Those so-called "sin" taxes. Guess what, don't "sin" and you don't pay the tax 8). Hey, I most certainly understand the pain here since I smoke and the taxes on cigarettes, even those I get nowadays that are made on Indian reservations, are astronomical. But if I didn't smoke, I'd end the pain. And there's always another route, as you yourself mentioned: the black market. It's going to come to that eventually, I predict, especially with cigarettes. History has shown that society can function just fine without government. Government was ordained by God. The only society that could possibly function "just fine" without government would be a perfect (i.e. sinless) or utopian one. Since human beings are not perfect and are not sinless, that society doesn't exist anywhere on the planet and hasn't since there ever were societies as we would define them today. Actually, to be more precise, not since the Fall of Man. One example of a thriving government-free society is the Viking settlement in Iceland that existed about 1000 years ago. Look it up. If that's true, especially the emphasized phrase, then it means they had to have a sizeable number of Christians among them, or at the very least believers in a higher power whose law they believed was supreme to mere man's law. After all, most of the founding fathers harbored "distrust for a strong central government" precisely because most were Christians and spoke frequently of the "hand of Providence" in everything. And a key reason for the Icelandic collapse was because of what I said above: The lack of competition and the monopolistic qualities that eventually came about when five families cornered the chieftaincy market was one reason. These five families bought the majority of chieftaincies. They controlled the court and legal system to a significant extent. This meant that there were not as many chieftains to choose from. This led to less competition, creating opportunities for increased exploitation over the free farmers, eventually leading to a revolt against the 5 families. IOW, the people became corrupted and their experiment in self-government failed just like ours is failing now. However, I'm not so sure that I would state categorically, as this writer seems to do, that this "godord" and "godi" arrangement by the Vikings on Iceland wasn't a government in ANY sense. I think it was one myself, albeit extremely minimalist by even our colonial period, but a form of government nonetheless. The actual effect of government is to decivilize a society. Government is not necessary for lawfulness, peaceful economic cooperation, or the division of labor. Look at the US now and in the past for a great example of this. Government has grown to unprecedented levels in the modern era. Is our society more civilized because of it? For a society to operate long-term in the complete absence of a government at all requires the epitome of self-government (even more than a republic would require since there would be no restraints upon the rudderless otherwise), which in itself requires a hardy modicum of virtue among the populace. That's practically nowhere evident these days among the commoners (populace); in fact, the evidence all around us suggests quite the contrary as our culture is becoming ever more perverted and depraved. I'm not confusing anything. Indeed, they are not always two peas from the same pod. Anarchy, at least in the short-term, caused by a temporary shutdown in government (e.g. Belgium presently, although they're not, as some are attempting to portray, experiencing a complete absence of government...sigh), for example, doesn't always result in chaos, obviously. But chaos, on the other hand, does often lead to anarchy. Well-crafted articles found here. Such a suprise. I fear that it is too little too late because the vast majority are sleepwalking into the coming prison-state. We really do need more Ron Pauls in the legislative rather than as the lone exec. I am ashamed for this country. There are such thing as 'good' taxes and 'evil' taxes. Let me explain. A 'good' tax would be any tax where the government cannot deprive you of life, liberty or property if you do not pay it. Sales taxes, 'sin' taxes, import duties, and others where you pay based on the amount of goods you purchase where the tax applies are examples of 'good taxes' as you have the option of not paying the tax simply by not purchasing the goods they are levied against and there is no mechanism by which you can be forced to pay or lose your property if you do not use the goods. Property tax, income tax, assessments, and the like where your assets may be seized for non payment are 'evil' taxes. Property tax is particularly nasty since it often includes the school tax and people who do not have children in the schools should not bear the same tax burden as a family with 4 or 5 children. Large families also produce more waste that needs to disposed of, use more water, electricity, gas, and produce more sewage than a single person or childless couple. Families also get tax breaks that individuals or childless couples do not. Not only aren't they paying their fair share to begin with, but the government is subsidizing their lack of sexual control by collecting more taxes from those without children even though they put less strain on government services than the families do. If you decide to have children, fine, but pay your fair share in taxes and don't put an extra financial burden on the shoulders of your neighbors. The inequity of the income tax could also be argued using the points above. Property tax as applied to real estate is most likely unconstitutional, but no court will ever declare it as such. Property tax is levied based on the value of the property and does not take the property owners income into consideration. What this means is it effectively makes it illegal for the poor for hold on to property because it will be seized as soon as they miss the first tax payment. This denies a group of people in this country a basic right that we all hold dear. To own property and be secure in it. It makes your constitutional rights contingent on a financial contribution to government in the same way that a poll tax does. If your right to vote cannot be infringed by the failure to pay a poll tax, then why should your right to own property be infringed by failure to pay a property tax? Personal property tax should also be declared unconstitutional. When you buy something, you should only have to pay tax on it once, at the time of purchase if it is an item that is subject to sales tax. Personal property tax makes you pay tax on that item year after year for as long as you own it. Not only is this unfair to everyone, but like the example above, it basically makes it illegal for those who can't afford to pay the tax to own anything as it would then be seized for non payment. How is a poor person ever supposed to get ahead and get out of poverty when faced with taxes on everything they may ever own and seizure of said items if they cannot afford to pay? So goes the slippery slope and this is to be expected when we ignore the fact that thegovernment telling us what we can or can not put into our bodies conflicts with very obvious Inalienable rights. 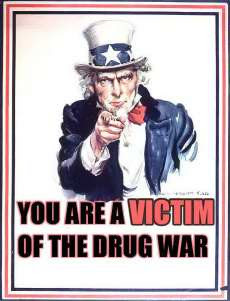 One of the only bloggers who understands that the war on drugs is and always will be a violation of private property rights and our 4th amendment.Civil rights have replaced our constitutional rights. The wealth that America accrued in the 20's and the 80's was magnificent .Want to control drug use ? Take away the social welfare safety net. How did .Karl Marx fat ugly loser who never saw a factory in his life write about economics and worker's rights ? Once we transferred one penny of wealth through military and social programs...America crossed a line of no return .Social welfare is a prison of limits and caps .The state now runs the capitalism...not the people .... Siding with Stain after WW2,the spoiled rotten ,dirty hippies , trading with Communist China , MLK 's Civil Rights act....the Patriot act ........ should tell you all you need to know .All helped get us here.We have been taken over from within with fluffy sounding words and a humiliating racist witch hunt just like they did during the Bolshevik revolution .The exact same class warfare and public shaming tactics are being used today right before our eyes.We are naive.Remember the road to hell is paved with good intentions.We have abandoned our constitution ......just as the founders predicted.....we fell to a flawed ideology Me ........I will always be an American.I will never subscribe to an ideology of losers and thieves.